In the early stages of your diet transformation it’s wise to stay away from restaurants you frequented during your overeating period. It’s best to avoid fast food joints. Though there are a few exceptions. For instances I still go to Chick-fil-a to buy a gallon of unsweetened tea. One tip here be careful when drinking tea it can be a water retention ally. Black tea has salt added to it. Don’t tempt yourself with these places if you don’t feel strong enough to only order the low-fat options. Because it's like riding that proverbial bike it's a habit…. One you do very well!! Going back to those old haunts is going to put you right back into the same frame of mind. Much like a reformed alcoholic trying to reject booze while going back to the bar he drank his life away in and trying not to order a drink! If you use the micro diets at the right you can be losing weight lots of weight in days without getting ill. Your brain is hardwired to eat well when in those environments. There is a very good chance that you will order the wrong foods then afterwards berate yourself for hours or maybe even days…and the cycle continues. The diet is shot to heck and your miserable again!! Should you find a new restaurant look over the menu, do they serve foods fitting your diet plan? You can always call ahead and find out what they serve. If you can't get sensible low fat, low salt, low sugar and zero trans fat dishes find another establishment. When Dieting Get a Micro Diet to Start Losing Weight Immediately!! It’s 10 times harder to remain on a healthy eating plan at a restaurant. My advice is to stay far away from eateries while you’re conditioning your body, mind, and emotions to enjoy smaller, healthier portions. Also remember you are in an adaption phase where you are establishing a new meal plan. Many places don’t have cauliflower and turkey burgers. Since I have changed the foods I eat I don’t spend much time in restaurants. 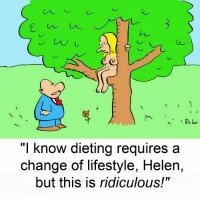 When dieting take the time to think: "How am I going to stay on this diet and continue losing weight? Try the micro diets on the right, all you'll lose is weight! !